We will exceded your expectations. 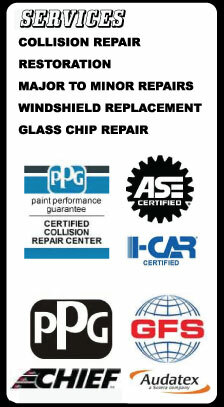 We will repair your car to pre-accident condition and warranty the work for as long as you own your car. We uses state-of-the-art equipment in all areas of our shop. Computer estimates, Chief-EZ-Liner measuring and straightening systems, PPG computerized paint mixing, and GFS paint booth are just a few of the investments we have made to ensure that your car will be repaired in the safest possible manner. Chad, Thank you so much for working us into your busy schedule. great company and it was a pleaseure to work with you.